Epic Games took a risk when they decided to offer Fortnite through its own site rather than the Google Play Store, but if any game could succeed without Google's help, it's Fortnite. After reaching 15 million installs in just 3 weeks, it looks like this game has paid off - and all this just in the beta phase! Let's take a look at the current state of Fortnite on Android. 15 million installs is impressive, but that's only part of the story. Fortnite for Android is currently in an invite-only beta phase, and over 23 million players have applied for the invitation, so there's a long line waiting for the most popular club in town. In a blog post marking the occasion, Epic Games stated that this is a similar rate of conversion to what it experienced during the iOS beta. If anything, Android users are adopting the game even faster than on iOS, where the game saw roughly 11 million installations in the first month, according to Sensor Tower, though the first two weeks of that period were a more limited "closed beta." Apptopia also records that it took the iOS version of Fortnite about three months to reach 100 million downloads. It's no secret that mobile games tend to take much longer to arrive on Android than they do on iOS. For anyone wondering about the specifics as to why, the Epic Games blog post lays out the path to getting Fortnite onto Android's fragmented software and hardware landscape in detail. The developer worked with engineers from Samsung, Google, Qualcomm, Razer, HiSilicon and others to optimize performance, graphics and memory usage. "To manage this complexity, we use the hierarchical device profile system in Unreal Engine. We start by creating four performance profiles: Low, Mid, High, and Epic. These profiles adjust scalability settings in the engine to allow the game to run on devices with different performance characteristics. Low pulls in view distances as far as possible and disables all optional graphics features. Epic has everything turned on: shadows, foliage, and the farthest view distance that can run on the latest devices." In addition to this, Epic Games has a set of profiles for GPUs (e.g. Adreno 54x and Mali G72) and specific devices, such as Google Pixel 2 or Samsung Galaxy S9. There are also some interesting stats regarding the Android versions being used by beta players. Apparently, 92% of players currently in the beta are running Android Oreo or newer, but around 8% are on Android Nougat, and the less than 0.5% are on a version of Android released in 2015 or earlier. "We’ll still be exploring older and slower phones but it’s impractical to go too far back. Every year, top-end phones are getting 50% faster than the year before. Fortnite runs acceptably on two-year-old phones, well on one-year-old phones, and great on phones released this year. At this pace, just imagine what Fortnite will look like on phones released next year!" There's been a history of fake Fortnite installers packed with malware taking advantage of the game's unavailability in the Play Store to trick people. To combat this, Epic Games says has a dedicated internal team which is tasked with taking down sites that claim to offer Fortnite downloads outside of the Fortnite Installer. To date, Epic has taken down 47 of these sites. 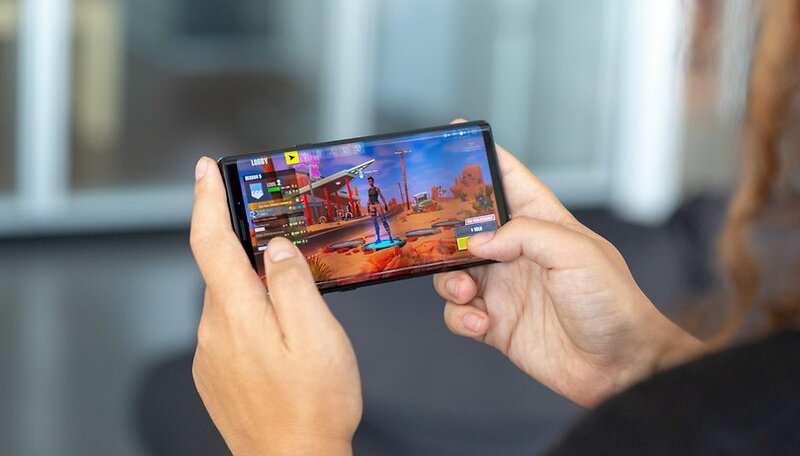 As Fortnite enjoys success on Android while still in the beta period, the battle royale shooter to beat on Android is still PUBG Mobile, which enjoys the advantage of being the first available and also easily accessible on Google Play. PUBG Mobile has more than 100 million downloads on Android and iOS, but only three million players in the US. Nonetheless, the head start counts for a lot, and in our recent reader poll, PUBG still proves to be the more beloved battle royale. But once Fortnite is out of beta, that could all change. Of course, Chinese megacorp Tencent, which profits from both games, will be making bank either way. Then these trailblazers will await competition from the next generation of battle royale games still to come. And you know how the games industry loves a (battle) bandwagon. Have you played Fortnite on Android? Or do you prefer a different game? Yeah, well, I installed it on my Note 9. After 10 minutes of play spending five minutes "loading" I uninstalled it.